치앙마이, 태국의 나 라 다 호스텔 | 호스텔월드에서 예약하세요. Single Bed Started from 250 THB / Night with breakfast is included. 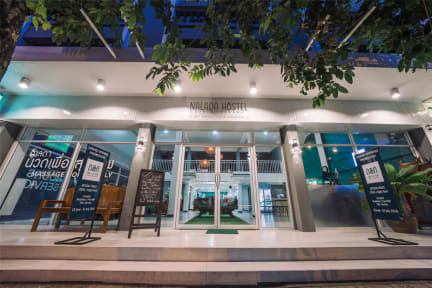 The hostel provide 24 hours front desk service. Na La Da Hostel partner with varieties of adventure & leisure tour providers. Our arriving guest can explore Chiang Mai with our help from Tour Expert staffs. Come and see it for yourself! Na La Da Hostel, the high ceiling gives nice flow of cool wind in our lobby. Thai artistry wood carved furniture, by a skilled carver, given the hostel a warm welcoming. Some of them are even older than 20 years, but still showing the great beauty of Thailand’s craftsmanship. We are hostel with 8 air-conditioned dorm rooms, there are areas where you can relax or make new friends. 24-hour drinks service, a shared lounge and sufficient tables to hang, have a fun chat or just to relax. Our bedrooms are completed with air conditioning, fans, and lockers. Every bed has a bedside reading lamp and power socket. You will receive a towel to use during your stay when you check-in without extra charge. We have all the facilities for you, such as massage. Travel Booking The rooms are clean and modern.We offer Thai massage, foot massage and oil massage at your special price. 1. 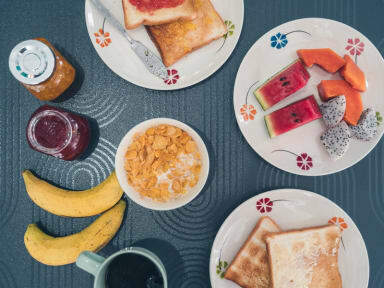 Breakfast: 6.30 A.M. – 10.30 A.M. including Fresh fruits, Toast and jams, Cereal and milk. 3. Free Drinks [24/7]: Coffee, Tea, Hot Water and Cold Water. 4. Free Strong Wifi Connection. 5. Relaxing Living Room: Comfortable couch and wide screen TV with Netflix available. 6. Feel like home atmosphere with music playing all day long. 7. Great Location: 2 minutes walk to Night Bazar. / 15 minutes walk to the old town Sunday/Saturday Night Market. 8. Free Map for wondering around the city. - Do it yourself with our provided Machine. - Check-out Time: 12:00 P.M.
2. Cancellation Policy: Up to 2 days advance notice before the arrival date is required. 5. Key Deposit: On top of the total amount, 100 Baht and Deposit towel 100 Baht will be collected as a refundable key and towel deposit. You will receive it back once you return the Key and towel as you are checking-out. 6. Age Restriction: The minimum age to check in is 18 years old. 7. Smoking is prohibited in bedrooms and common spaces. It is allowed only in the outdoor area or Rooftop. Cozy lobby, clean room and friendly staff!!! I still miss this hostel. Everything was wonderful.